30th May 2014 – Olympic silver medalist Galen Rupp (USA) brought the house down with victory and an American record in the 10,000m on the opening day of the Prefontaine Diamond League Meeting. Having set two American records during the indoor season Rupp asked for a quick pace and set about the task in hand. Undoubtedly spurred on by racing on his hometown track of the historic Hayward Field and backed by a partisan crowd, Rupp slotted into the pack and passed halfway in 13:27. Still looking relaxed and confident as the laps counted down Rupp continued to follow the pace that was now taken on by Kenyan Stephen Sambu. With a mile remaining it was Paul Tanui who took the lead but again Rupp effortlessly covered the move. 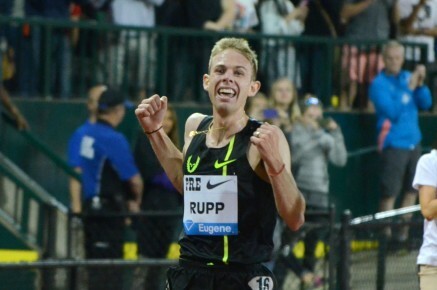 With 850m to run the scene was set and Rupp took off for the win and the record. Galen ran an incredible 1.57 last 800 to eclipse his previous PB by over 3 seconds and set a new mark of 26:44.36. This is the fastest time in the world in 2014 and 15th fastest in the world All-Time list. There was cause for double celebration too, as in his post-race interview Rupp announced that his wife is expecting twins!